Attention students, parents, and guardians: the first progress report of semester one will be provided to students on Tuesday, October 11. These reports are designed to give an idea of how a student is progressing in class. Progress reports are given directly to students, who are expected to bring them home. 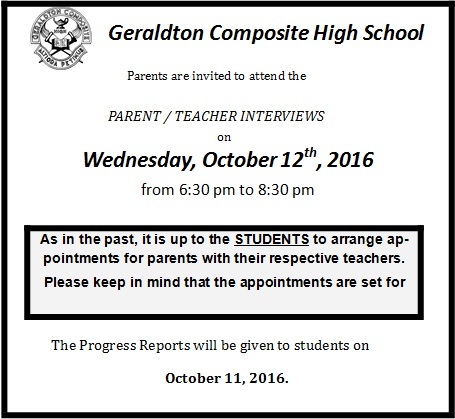 GCHS will host parents/guardians for a Parents’ Night on Wednesday, October 12 from 6:30pm-8:30pm. Appointments for ten-minute sessions can be made with each teacher by students. If you are unable to attend Parents’ Night but still have questions about a student’s progress in a course, you are invited to contact the teacher through the high school. For any other information or for questions, please contact Mr. Luomala, GCHS Principal.